"I rode my bike to work yesterday. After years of my inside voice saying 'you can't do it", I did, and liked it! I will say that even though it's "just like riding a bicycle", the traffic part also intimidated me knowing I'd have to ride through town to get on the Galloping Goose trail. I'm glad to have taken a great one-on-one refresher lesson from Susanna Grimes at Joyriding.ca. Was brought up to speed with rules of the road and traffic safety-and confidence. I'll be doing this cycle thing more often!" 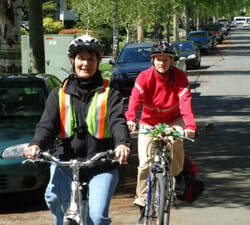 "Susanna is experienced, professional and enthusiastic about cycling as an alternative mode of transportation. After several years of avoiding cycling, I now feel much more confident about cycling in downtown traffic. I highly recommend her to others looking to improve their safe riding skills." Cycling lessons can be taught in different formats, depending on - and tailored to - your individual level of skill, fitness, knowledge and comfort. * You haven't ridden a bike for YEARS, and need to get comfortable again. * You only ride recreationally, but want to start riding to work or to do errands. Lessons are typically taught in one and a half hour blocks of time. Initially we start in a parking lot or quiet area, where bicycle fit & safety are checked and your bike handling skills are assessed. After that, things progress at your pace. If you are learning how to ride a bike for the first time, you will need a lesson or two in a quiet area. If you know how to ride - you may be ready to head onto the streets after some practice . But beforehand, we will review principles of cycling on roads and in traffic. Then - start out on quiet streets and progress to busier ones. You may have a specific route that you would like to practice: to work or school, to your child's daycare or the yoga studio or your local shopping area (or wherever!). If you prefer only riding on the Galloping Goose, that's OK too. It is all up to you. You will not be pressured into doing anything you are uncomfortable with (OK, a bit of friendly pressure is often needed). would like to learn with you, the total cost is the same! Lessons are $65 for 1.5 hrs or $75 for 2.0 hrs. A 2-lesson package is $120 (recommended for brand new cyclists). Fitted bicycle and helmet rental are included in the cost. Teaching Uma how to ride a bike for the first time in her life. Rachel riding on her own for the first time - after only 90 minutes. Yay! "Susanna: I just want to tell you that I am now able to ride around the neighbourhood without falling off my bike! I’ve not been out that much since the weather turned cold but through the summer and fall, I got out just about every day--first just going downhill through the kids’ park nearby and then in the back streets. I feel confident now that when I get back on in the spring I won’t have to learn all over again. Thank you for all your help!" Uma K.
You can read Uma's blogpost about her lesson here. 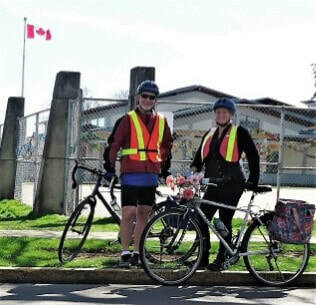 “When I moved to Victoria from snowy Alberta, I had visions of taking up bike riding for exercise and fun. My enthusiasm was a little premature since I hadn't been on a bike for well over 50 years. I bought a lovely “Townie” bike and called Susanna with hope and a lot of fear. She was wonderful -- endlessly patient and helpful in getting me past my fears. She is a great teacher and really knows everything there is to know about bikes and bike riding. "This morning I had my lesson with Susanna. Excellent experience, teaching, practices, and excellent advice. Susanna was also able to give me the confidence I so much needed; I so appreciate this. I learned so much and what a wonderful teacher she is. Susanna is the teacher I needed for my road practice, as downtown ain’t for me! Thank you again! " Marietta B.